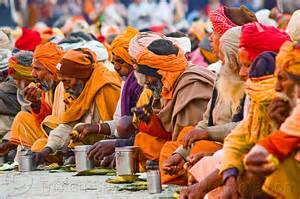 Hinduism places such great emphasis on the role of food that it has been called "the kitchen religion." 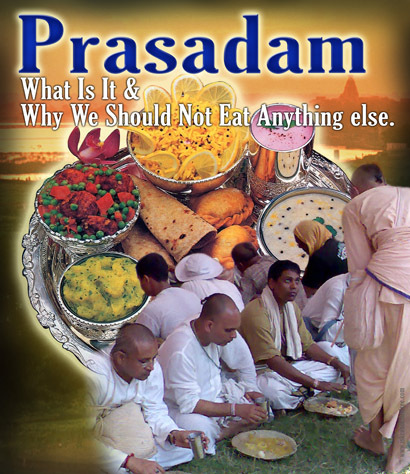 No religious or public function is complete without the distribution of food, especially prasada (food offered to God). There are many complex rules regarding the preparation and consumption of food. Vaishnavism has developed a sophisticated theology, which classifies all eatables according to the three gunas. Meat is usually shunned as it is considered tamasic, influenced by darkness. Shaivites observe fewer dietary restrictions and Shaktas are usually inclined towards meat, traditionally obtained from animal sacrifice. Although some Hindus eat meat, almost all avoid beef out of respect for the cow. India has developed a vast vegetarian cuisine, beyond the imagination of most Westerners, who often picture vegetarians eating little more than nuts, fruit, and salad. Milk products are considered essential to a vegetarian diet and ghee (clarified butter) is a widely used frying medium. Spices provide taste, aid digestion and promote good health. A typical meal consists of several preparations, but most often the main meal, at lunchtime, will consist of rice, sabji, dahl and chapattis. Food plays an important role in worship, and the food offered to the deities (prasad) is thought to bestow considerable religious merit, purifying body, mind and spirit. Temple cooks are usually brahmanas and follow strict standards of personal cleanliness. There is widespread belief that the consciousness of the cook enters the food and influences the mind of the eater. Taking prasada that has been cooked and offered with devotion inclines the mind towards spirituality.